This is quite a long article by Eliza Barclay backing a School in the USA to terminate meat & dairy on the school menu. ( 8th June 2014) I found it an inspiring report & wonder how long it might be before other Schools follow suit. I was particularly touched by the comment that so many of us consider or like to think of ourselves as Environmentalists, & yet in many households, animal products are still consumed....food for thought most certainly! Suzy Amis Cameron, wife of director James Cameron, and gardener and educator Paul Hudak inspect seedlings in the MUSE School CA greenhouse in Calabasas, Calif. Amis Cameron, who founded the school with her sister, wants the school menu to be entirely plant-based by fall 2015. As we've been reporting, the quest to get more fruits, vegetables and whole grains into public schools has once again gotten political. But in spite of the new, federal standards for school nutrition, "changing a school lunch cafeteria, especially those that participate in the National School Lunch Program, it is like turning around the Titanic," says Susan Levin, director of nutrition for the Physicians Committee for Responsible Education. However, if you happen to have performed in the movie Titanic, as Suzy Amis Cameron did, and you happen to have founded a private school that you and your world-famous director husband support, as Amis Cameron also has, then maybe revamping a school cafeteria isn't such a tall task. You might even be able to eliminate meat and dairy altogether, and create the first plant-based school in the U.S.
A lot of schools lately have been making incremental changes toward more plant-based options, says Levin. 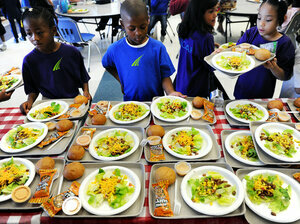 Take the Meatless Monday program, which is now in hundreds of K-12 public and private schools. One public school, P.S. 24, in Flushing, N.Y., even went completely vegetarian. But Amis Cameron's plan for MUSE School CA, the environmentally focused school in Calabasas, Calif., that she founded with her sister, Rebecca Amis, in 2006, is even more ambitious. "We are gradually moving toward a plant-based menu because we do call ourselves an environmental school," Amis Cameron tells The Salt. "Within the next year and a half, we will be plant-based." SOAR Charter school in Denver, Colo., is one of many schools that's serving more vegetarian meals. Keshan Pride, 6 (in blue), looks over his choices during lunchtime in 2011. Private schools like MUSE School CA, of course, have a lot more flexibility when it comes to deciding what goes on, and what comes off, the menu. Already, the school has a strong seed-to-table program that's producing fresh fruits and vegetables grown by its 140 students. They're guided by the school's full-time, year-round gardener and educator, Paul Hudak. He and students at the school's two campuses in Malibu Canyon have built 28 raised beds to grow peppers, greens, tomatoes, herbs and other edibles, plus flowers. The older students will also be selling some of the food grown over the summer to local restaurants. Hudak says now that the schools are growing produce year-round, they can supply up to 20 percent of the food consumed in the cafeterias, depending on the season. "Once we really get cranking, I think we'll be up to 40 or 50 percent," Hudak says. Food played a role in sparking Amis Cameron's motivation to start the school in the first place. She and her husband, James Cameron, one of the world's most successful directors (yes, Avatar, the Terminator films and Titantic), have five children, including one from her previous marriage. The family splits its time between their home in Malibu, their ranch in Santa Barbara and their 3,500-acre farm in New Zealand. As she phased out modeling and acting in the late '90s, Amis Cameron focused on her children and their education. And as she did, she says, she became increasingly frustrated with the schools they were in: "They were really wanting to put our children in a box." Then, in 2005, Amis Cameron was driving her 4-year-old daughter home from school and heard her daughter describe a math lesson with candy. "The school she was going to — that touted itself as an environmental school — was teaching my child to count with M&M's," Amis Cameron says. "And everything in my life came to a screeching halt." She and James started talking about the possibility of starting their own school for their children and other kids whose parents were looking for an alternative to the schools in Malibu. "Jim was trying to decide between doing more deep-ocean exploration, or make a little film called Avatar," says Amis Cameron. "He decided to make Avatar, and I decided to start MUSE. And off we went in our different ventures. Now, nine to 10 years later, it's all coming full circle, dovetailing." While MUSE School CA has grown to 140 students — two are Camerons, and half receive financial aid — it's still not an accredited school, though Amis Cameron says they're working on that. She and her sister, Rebecca, have tried to walk the sustainability talk on campus, using recycled materials to build the classrooms, installing solar "flowers" designed and donated by James to power the school with renewable energy, and by hiring a resident falconer whose hawks eat rodents and eliminate the need for pesticides. Over time, the Camerons' environmentalism — which features heavily in the ecological destruction narrative of Avatar — has become more and more centered around food. The turn happened, Amis Cameron says, when the couple went vegan in 2012 after watching the documentary Forks Over Knives. The film emphasizes the health benefits of a plant-based diet, and that initially compelled them to empty the cupboards and fridges of all dairy and meat products. "But what has really been a major eye opener is the connection between food and the environment," says Amis Cameron. "Now, we're benefiting greatly from eating plant-based, as are our children, but the environmental piece has become really our sole focus." Specifically, Amis Cameron says, she's appalled by all of the water and grain it takes to produce meat and dairy, and all of the greenhouse gas emissions, waste and pollution that production generates. And everything she's learned lately about animal products and the environment has coalesced into a singular conviction: "You can't really call yourself an environmentalist if you're still consuming animals. You just can't." While there is a consensus that the meat industry has taken a heavy toll on the environment, few people agree on what to do about it. And many environmental scientists are not convinced the solution is for everyone to give up animal products — especially people in the developing world who haven't had ready access to them. One recent study we reported on argued that to prevent more greenhouse gas emissions from the livestock sector, we'll get the biggest bang for the buck by helping producers become more efficient and keeping land from being converted for grazing. The researchers say that while consumers in rich countries could stand to eat less meat, it's not realistic to expect us to give it up entirely. "It's not a matter of giving up meat. It's a matter of shifting to other kinds that have less climate impacts," one scientist told us. So, not as much beef and pork, and maybe more farmed fish and insects. But Amis Cameron, like a lot of other activistswe've interviewed, argues that avoiding animal products is still the most powerful decision a consumer can make — more significant than buying a hybrid car or LED light bulbs. In addition to transforming MUSE School CA into a vegan school, Amis Cameron is writing books on the environmental impacts of meat production for different demographics — moms, teens, children and thought leaders, she says. The Camerons also regularly give speeches where they talk about their newfound veganism and why they're primarily motivated by concern for the planet. "Any extra bandwidth that we have is spent on that piece and ... bringing that message out into the world," she says. "We have an amazing platform." But even with all their influence, Amis Cameron admits that it hasn't been easy to convince other parents at MUSE School CA that the chicken, turkey and cheese currently served at the school have to go. "Food is a very sensitive subject for so many people," she says. "People have their cultural reasons for eating meat, their traditional reasons, their likes and dislikes. But slowly we are offering educational programs through MUSE, for not only the children, mainly for the grownups, because the children, they live and breath [the environmental way] already." Is Vegan Healthy For Kids? Levin of PCRM says that a vegan diet can be healthy for kids — even the Academy of Nutrition and Dietetics has ruled that kids can get everything they need from plants alone. "Most people assume it's so hard to make kids eat vegan — that it's easier to give them the chicken nuggets and the milk, and the cheese," says Levin. "But I don't think anyone could defend that they would be less healthy by not consuming animal products." And while Levin sees MUSE School CA's move toward a vegan menu as an anomaly, she says she applauds what Amis Cameron is doing. "They might be in a privileged position to advocate for dietary choice, but it ultimately shows other people how effective it is," says Levin. And, Levin adds, many plant-based foods, like rice and beans, aren't prohibitively expensive for schools. "It shouldn't be an entitled program. You don't have to be rich to be plant-based." The Camerons were the initial MUSE School CA donors, and continue to supply startup funds as the school has expanded from elementary to middle to a high school slated to open this fall. But Amis Cameron says the plan is for the school to become self-sustaining. "We've capped what we give, and we decrease the amount every year," she says. "But, gosh, it's a great place to be a philanthropist."